Edward Weston, AIEE President, 1888 - 1889, improved electrical instruments so that they would be more portable and that their measurements would become more accurate. In 1908, his standard cell became the universal standard of electromotive force. Weston was president of the AIEE from 1888 to 1889. Weston was born in Shropshire, England, in 1850 and received his formal education in that country. From childhood he manifested a keen interest in electrical and mechanical research. Coming to New York City in 1870, he spent two years as chemist and electrician for industrial concerns before establishing his own nickel plating business in 1872. He maintained this activity until 1875, when he became a partner in a firm for the manufacture of dynamo-electric machines. 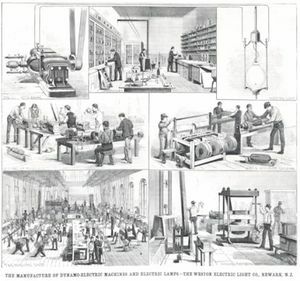 This business was incorporated as the Weston Company in 1877, and in 1881 was consolidated with the U.S. Electric Light Company, where Weston served as electrician until 1888. While in this position he received many patents on dynamo construction, and conducted extensive investigation in the lightning field. At this time he encountered in all his researches great difficult in making the necessary electrical measurements with the clumsy and slow instruments then available. Weston therefore developed and built for his own experiments a set of more practical instruments. These were so successful that in 1888 he abandoned his other interests and devoted all his time to the innovation of accurate and convenient electrical instruments. He established the Weston Electrical Instrument Company, of which he served as vice-president and general manager from 1888 until 1905, and president from 1905 to 1924. His achievements in developing instruments of a high level of accuracy and ease of portability were well known. In 1908, the Weston standard cell was accepted as the universal standard of electromotive force. 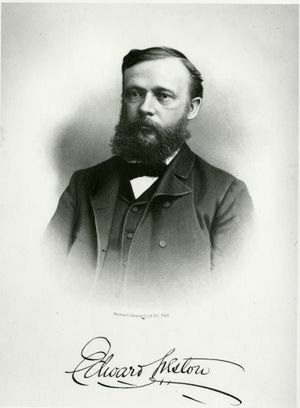 In addition to being a charter member of the American Institute of Electrical Engineers, Weston was a member of its first board of directors and served as manager 1884-87. Following his term as president, he was vice president 1889-91. He is a member of several other engineering and scientific societies, being an honorary member of the Franklin Institute. Doctor Weston has received the honorary degrees of a doctor of laws from McGill University, 1903; doctor of science, Stevens Institute of technology, 1904, and Princeton University, 1910. His interest in the younger members of the profession was demonstrated by his establishment of a fellowship in electrochemistry, managed by the Electrochemical Society. This fellowship of $1,000 was awarded each year to a candidate under 30 years of age who showed marked capacity in carrying out research in electrochemistry or its applications. Edward Weston became chairman of the board of the Weston Electrical Instrument Corporation at Newark, N.J., and as one of the six living charter members of the Institute, was elected as the fourth president of the A.I.E.E. The citation accompanying the award to him of the Institute's Lamme Medal in 1932 "for his achievements in the development of electrical apparatus, especially in connection with precision measuring instruments," summarized the outstanding interest of his long and active life. This page was last edited on 25 April 2017, at 15:14.